In the good times of the Constantinian Church, every advertisement in a Catholic newspaper was carefully analyzed before being accepted. Any inconvenience it might have was a motive to reject the ad. The principle behind that vigilant attitude was that a Catholic paper must be a model of Catholic Faith and Morals. The editors and journalists also had the clear notion that they were accountable before God for every word printed, photo chosen or ad allowed. 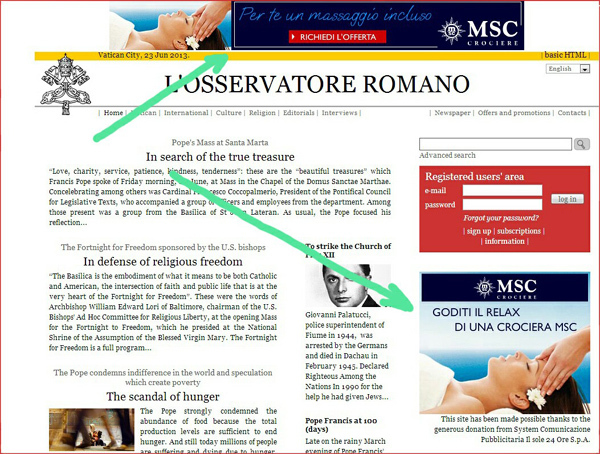 Today, we have the official organ of the Holy See, L'Osseratore Romano, promoting an advertisement for massages on the portal of its English edition (June 23, 2013), above. The ad was paid by the MSC cruise company, which offers a free series of massages for the Catholics who purchase one of its tickets. The ad on the top of the page reads: "For you, a massage is included. Mention this offer." The ad in the middle left of the page reads: "Enjoy the relaxation of a MSC cruiser."